A total of 12 walkers piled out of the bus at Muddy Creek: a bushwalking club from Christchurch, paddlers Ange and Craig, Jo and Eileen from Seattle, a solitary walker, and Heike and I. We all set out at a brisk pace along the four-wheel drive track, but by the time we left that behind and hit the muddy bits, our pace slowed down. The view of the valley we walked into was beautiful, but it was a long day and after endless grassland, a steep ascent through forest, countless up and down crossing of streams, the pack started to weigh like a menhir and the usual mantra started in my head: “Where is the ******* hut?” A bit further on clearly. Muttering under my breath at every new stream I had to cross, suddenly, like a mirage, there was a swing bridge to cross to the other side of the valley and behind it, just slightly uphill, was the hut. And there were still free bunks! Once we had cooked up some food, we also found our conversation again and we chatted with the rest of the walkers who trickled in one after the other. The second day was much shorter, but rougher. The skies were overcast, but it was dry and we walked gradually uphill. 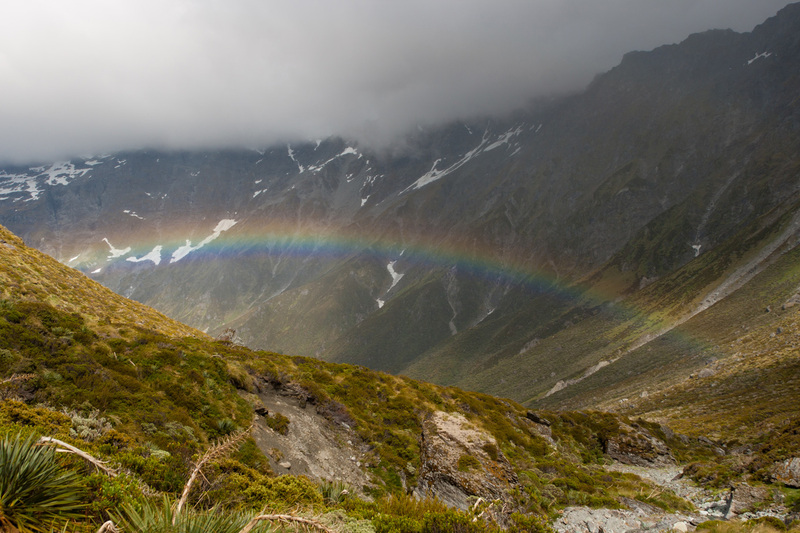 At one point looking back down the Rees Valley we saw this amazing rainbow straddling the valley. Further on, after donning gloves and beanies against the increasingly cold wind, we realised where the track went up to the saddle… surely NOT?! That wasn’t just steep; it looked perpendicular! We worked our way slowly upwards, groaning under our packs, and at times on all fours, but on the saddle the view opened up to Snowy Creek, thundering through the valley below. Further down we reached the bridge that links to the other side of the valley. Every winter the bridge has to be removed to avoid it being risked in avalanches, as the Snowy Creek Valley fills up with snow. The evidence of that was still there, a disintegrating snow bridge on the side of the constructed one. From here it was a steep descent to Dart Hut, and I mean steep. My legs are long, but even I had difficulty to step down without doing the occasional bum slide. Eventually we reached the delightfully positioned Dart Hut, possibly my favourite hut on all of the walks. With walkers converging here coming up both the Rees and Dart Valleys, as well as those who coming from Aspiring Hut via the Cascade Saddle, we were lucky to find ourselves bunks. Not long after we arrived a drizzly rain started, but we were snug, sipping tea in the communal area, waiting for the rest of the “crew” to arrive. It was still raining the next morning, but as the side trip to the Whitbourne Valley wasn’t possible due to the bridge having been washed away, and the only other option of Cascade Saddle challenging due to the rain, we decided to take it easy and just enjoy a rest day; this was a holiday after all. The rain cleared around midday, the sun came out and we sunbathed on some rocks near the river and spent time talking to other walkers. Later that day we met up with the Christchurch walking club again who had made it to Dart Hut. The next day we started early for Daleys Flat Hut. The hut is infamous amongst walkers on the track for the squadrons of sand flies who terrorise (un)suspecting walkers there. But first we had the most enjoyable day walking through grassy fields, the Dart River on the right, while gradually descending down the Dart Valley. Early cloud slowly evaporated to reveal glaciers clinging precariously to mountain faces like wobbly meringues. During our lunch break we were stalked by a robin who relentlessly pursued crumbs. Not even a camera lens poking at his beak put him off. We saw many of these birds along the track, who often looked annoyed at us occupying their favourite log for a quick break and would fearlessly try to chase us away. When we arrived at the hut the sand fly squadrons gave us a ceremonial welcome, but after sorting out bunks and dumping our packs, Heike and I found a sand fly free place for a quick dip in a side stream a short distance away from the hut. Cold water never felt so good! Ange and Craig finally arrived with many wet items; their first effort of floating down the Dart had a few obstacles, including a capsizing canoe and belongings drifting down the river, but they were determined to give it another try on the final day of the walk. And indeed on New Year’s Day they floated all the way down the Dart River, cool and collected, and the envy of all of us who had to carry our packs out. New Year’s Eve was celebrated by everyone in the hut agreeing to move midnight forward to 9pm so we could all have a decent sleep. And so after dinner we welcomed in 2012 by sharing champagne, vodka, glo sticks and whatever else people had, singing Auld Lang Syne (mainly humming along to it – does anyone ever know the words?) and wishing each other a happy new year. The next morning everyone was up early to make sure we all made it in time to the end of the walk for our bus transport. The walk downstream was easy and pleasant, despite the roar of jet boats disrupting our bucolic experience. It was a reminder that we were getting close to civilisation again and although we all looked forward to a good shower, there was regret that the walk was over already. The transition can sometimes be abrupt, particularly after five days ‘out’ and connections made with fellow walkers can sometimes evaporate quickly when the bus delivers you back to civilisation, but in this case we managed to catch up with Jo and Eileen for a well-earned drink in Queenstown, before departing the next day towards part 3 of our NZ adventure. Brilliant. Certainly seems like a challenging walk, but enjoyable all the same. I can picture the group struggling to stay up until 9 pm on NYE waving glow sticks and singing. Great stuff. Enjoying the journey. Keep them coming. Gorgeous photo – is that of Cascade Pass? No, it’s not Cascade pass. It’s actually looking back into the Rees Valley, a part of the walk you haven’t seen yet!